“Four score and seven years ago our fathers brought forth on this continent a new nation conceived in liberty and dedicated to the proposition that all men are created equal. Now we are engaged in a great civil war, testing whether that nation or any nation so conceived and so dedicated can long endure. “We are met on a great battlefield of that war. We have come to dedicate a portion of that field as a final resting-place for those who here gave their lives that that nation might live. It is altogether fitting and proper that we should do this. But in a larger sense, we cannot dedicate, we cannot consecrate, we cannot hallow this ground. The brave men, living and dead who struggled here have consecrated it far above our poor power to add or detract. The world will little note nor long remember what we say here, but it can never forget what they did here. The Gettysburg Address is arguably Abraham Lincoln’s most famous and most quoted speech. His purpose was two-fold. First, to honor the fallen soldiers who sacrificed their lives on the battlefield, and second, to persuade a divided nation to mend fences. Most amazing of all though is that he did it in less than a minute and a half. To his Jewish listeners, the story of Siloam was a well-known part of their history. To his listeners, he was very persuasive in just about ten seconds. Here is a more recent example: President George W. Bush in his 2002 State of the Union Address where he said, “For many Americans, these four months have brought sorrow, and pain that will never completely go away. Every day a retired firefighter returns to Ground Zero, to feel closer to his two sons who died there. At a memorial in New York, a little boy left his football with a note for his lost father: Dear Daddy, please take this to heaven. I don’t want to play football until I can play with you again some day. This simple formula is one of the most effective ways that we have found to persuade people. Or if tension is high and trust between the parties is not strong, even if we don’t persuade the other party, we might at least allow ourselves to be heard by the other party. 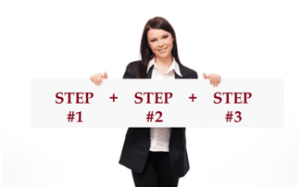 The three-step process is the IAB formula. I-Incident or Story: Tell a story to establish rapport, gain credibility, and build common ground with your audience. Personal incidents tend to work best in these situations. A-Action: Tell your audience what exactly you want them to do based on the story that you just relayed to them. This action statement should be crisp and concise. The fewer words the better. B-Benefit to the Audience: Tell the audience what they will get if they do what you ask. This should also be very clear and concise, and should be totally focused on the benefit that the audience will receive. Here’s an example. Let’s say you have an employee, a sales representative, who has a habit of showing up late for work. A personal example like this might work to help persuade him to come in earlier. Your audience is more likely to remember the story than they would an order that you give them, and they will be much more likely to cooperate enthusiastically. People don’t like to be dictated to or ordered, but many will gladly do things that you suggest indirectly if it is clearly in their best interest. By telling them exactly what you want them to do, you avoid miscommunication, and by telling them how they will benefit from the action that you suggest, you are motivating them more effectively as well. So if you want to get more enthusiastic cooperation from your audience, try using the IAB formula.